Online Store's Site tab lets you apply changes across your store, such as adding a logo or turning off a banner, analyzing visitor traffic, and sorting products. Click the Store Design tab, and click the Site tab. 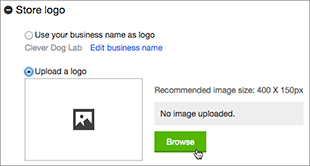 To upload your business's branded logo, click Upload a logo in the Store logo section, and browse to the image you want to use. Use the Sort by menu in the Product Display section to control the order of products on a page, then set the Number per page. Select Make phone number a required field if you want customers to enter a call-back number during checkout. Uncheck the box in the Powered by Online Store section to turn off the default message at the bottom of each page. Note: You must have a Google Analytics account to activate site tracking. If you don't have one, learn how to set up Google Analytics account. Click Save and View Store to see your changes. See Set my theme to control the overall appearance of your site's pages.